Mind maps have a long history, dating back to the third century. Early thinkers and philosophers used graphic designs to diagram various concepts, words and ideas that related to a central thought. Mind maps are a visual method for recording thoughts and related ideas graphically. It works by using one central keyword or idea and surrounding it with a brainstorm style shower of thoughts that somehow relate to that central word. The beauty of the mind map is that it is a very freestyle way to collect and organize information, without being restricted to a particular structure. Use of connecting lines, colors and symbols work together to boost visual perception of the physical map and to increase memory retention of the information. This has made the use of mind maps particularly good for business meetings and group project brainstorming sessions. Since there is no structure to follow, a free flow of thought is generated. Ideas can come from anywhere and be placed somewhere upon the mind map for later organization. It speeds up the process of generating thought, making decisions, solving problems and studying ideas. 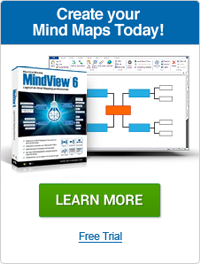 There is no wrong way to create or contribute to the making of mind maps. Everyone can participate in mind mapping and feel like their contribution is valuable; no ideas are too big or too small to fit on mind maps. Copyright © 2019 mindmaps.net All rights reserved.